A Registered Society registered under Societies Registration Act, 1860 and under adn-rinistrative control of Ministry of Water Resources, River Development &. Ganga Rejuvenation, GoW. 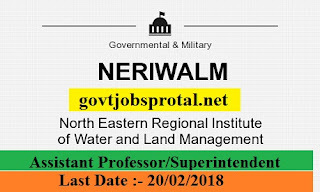 of India) Applications for the following posts are invited from eligible candidates in prescribed format along with all necessary documents and testimonials for the following posts to be submitted to "The Director, NERIWALM, Dolabari, Tezpur, P.O. Kaliabhomora-784 027 (Assam)" in registered/speed post on or before 2 (two) months from the date of publication of the advertisement in the Employment News. Details regarding application format, eligibility, qu4lification etc. 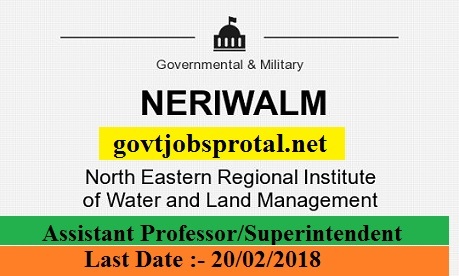 may be found in website rvrvrv.neriwalm.gov.in. Applications for the following posts are invited from eligible candidates prescribed format along with all necessary documents and testimonials for the following posts to be submitted to, The Director, NERIWALM, Dolabari, Tezpur, P.O.- Kaliabhomora- 7g4027 (Assam),, in registered/speed post on or before 2 (two) months from the date of publication of the advertisement in the Employment News. 1.Master Degree in Water Resource Engineering / Water Resource Development / Irrigation Water Management I Irrigation Water Development/ Watershed Management/ Soil & Water Conservation or equivalent Master Degree in Water Sector. 2. Having 3 (three) years' experience in teaching/research in Govt. organizatron/pSU/autonomous body or 3 (three) years' experience in regular post of Research Associate or 5 (five) years in field and development work. 3.Bachelor Degree in Water Resource Engineering / Water Resource Development I Irrigation Water Management I Irrigation Water Development / Watershed Management / Soil g. Water Conservation Engineering / Agriculture Engineering. (i) Working knowledge of Computer Application. (ii) Master Degree in related subject. (iii) At least two years experience in the relevant field in Govt. / Quasi Govt. / public Sector Undertaking in Research Work. The crucial date for determining the age limit shall be closing date for receipt of applications from candidates in India (and not the closing date prescribed for those in Assam, Meghalaya, Arunachal Pradesh, Mizoram, Manipur, Nagaland, Sikkim, Ladakh division of Jammu & Kashmir State, Lahaul & Spiti district and Pangi Sub-Division of Chamba District of Himachal pradesh, Andam an & Nicobar Island or Lakshadweep). In the case recruitment made through the Employ-.ni Exchange, the crucial date for determining the age limit shall be the last date up to w-hich Employment Exchan[e is asked to submit the names. (You will get more information in employment News paper dated on 23/12/.2017 Page no.(7).) Visit the official website for more information.